I wish I had a clearer shot. The iPhone kept focusing on its rear instead of its head. 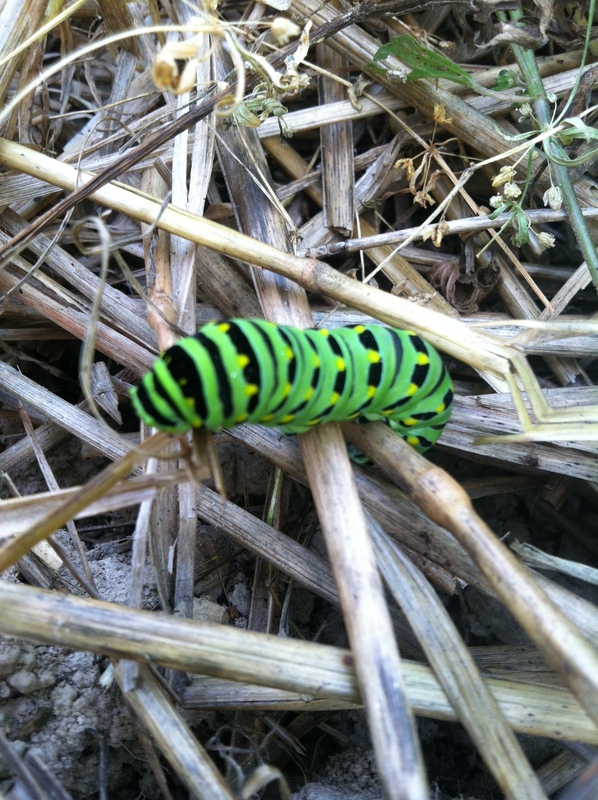 At any rate, this guys is a late instar (larval) stage of a black swallowtail butterfly (a.k.a. eastern black swallowtail, American swallowtail, parsnip swallowtail, parsley swallowtail, celery worm, and caraway worm). It likes plants in the carrot family (ergo finding it while digging up carrots). The larva go through several instar stages with younger ones being more black and white with spines. The spines disappear as the instar ages and the black coloration fades to a vibrant green that you see in the above photos. Apparently, the larvae have a gland located in its head region that everts itself when the caterpillar is startled or threatened. The gland, forked and brightly colored orange, is called the osmeterium. This gland also secrets a foul-smelling material made up of terpenes (glad I didn’t experience any of this action). Although the sight and smell are alarming, unlike the Io moth larva I encountered last week, this guy is not dangerous to us at all. Glad I didn’t startle my new little friend. Though these guys like to eat parsley, dill, fennel, celery, carrots and such (probably impact commercial farms more than a small farm like ours)….they actually become beneficial insects to the garden. 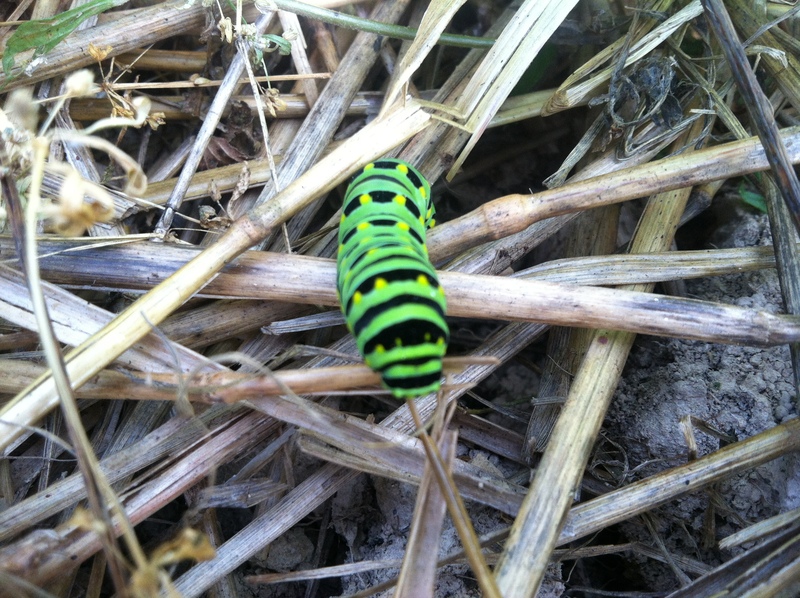 The eastern black swallowtail is a key pollinator, so I say welcome little larva. Hope when you pupate, your chrysalis camouflages you from the birds and other predators that might cross your path. 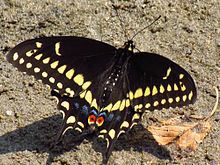 The male butterfly has more prominent yellow coloration with bright red eyes on the hind wing. The female butterfly has pale yellow coloration and brighter blue margins of the hind wings. Either one will be most welcome to our farm! What a pretty green color. Amazing isn’t it? The contrasts are so vibrant. An iPhone photo doesn’t do it justice.